Dee also mentions the Info Trace business information, marketing database and research service which you can usually access via your local library. Some libraries charge a small fee for the service. She also mentions the Rosemary Conley classes. For more marketing ideas, sign up for our weekly Essential Business Nudges – quick tips to help you build your skills and build your business. Announcer: You’re listening to the Masterclass series from Essential Business Radio. Julie Stanford talks to the experts. In this programme, we hear from marketing expert, Dee Blick and discover more about the target audience for your business and how to find it..
Julie Stanford: Why is it so important, and what’s the value in doing this? What happens if you don’t find your target market? 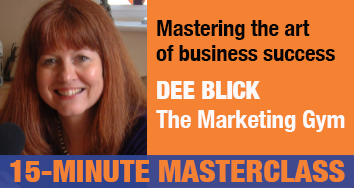 Dee Blick: I think most small businesses, their first reaction when they start up, or even when they’re quite mature, is “everybody’s got a need for what I offer.” That may well be true, that everybody does have a need for what you offer, but you’ve only got a limited amount of resources and you can’t target anyone. Not only that, even though people may have a need, it may be they wouldn’t use you because you’re too small, they’re tied into an existing arrangement. What can also happen is that in your zeal to target everyone you end up taking on work that you either have to outsource bits of it because you’re taking it on and you’re not really competent to do every element of that project. You end up offering ‘mate’s rates’ at your local networking group, and so it can drag you into a bit of a downward spiral. It’s almost like laser-honed targeting. If you know who you want to communicate with, and why, firstly you develop the most amazingly relevant, sharp, compelling sales messages that they’re going to listen to. Secondly, it saves you an awful lot of money and time. I do know that one thing that small business owners lack is time, because they’re so busy ‘close to the coalface’ with their business that the thought of spending flipping hours and hours working who they want to reach can be onerous. Target, and target tight, and it will pay you back in dividends. Julie Stanford: I know, as a listener, if I were listening to you I know what would be going on in my head. I’d be thinking “Okay, I understand how important it is that I do that. I haven’t a clue how to do that.” How would a business owner go about finding that target audience, before they think about the messages? We’re going to talk about that in other masterclasses in depth, aren’t we? Dee Blick: We are, yeah. Julie Stanford: Let’s think. How would someone go about finding their target audience? Dee Blick: Should I probably give you a couple of examples of real businesses that have done it, rather than start spouting the theory, because that will have more relevance? We came up with accountants, because, naturally, accountants have got lots of documentation that’s confidential that they don’t have to keep, but that needs disposing of in a confidential way. We came up with recruitment consultants, because, again, they have lots of candidate information that … they don’t want to keep it, but, equally, they don’t want to just stick it into a bin. We then got small lists. We pared it down even further, based on size, because we tried to aim at businesses that are reasonably large. They’re not just shoving it through a shredder, their documentation. We came out with a small list of accountants and recruitment consultants, and they were the first groups that we targeted. Julie Stanford: That geographic spread is where that comes in. Dee Blick: Very much so, because there’s no point in targeting companies that are three hundred miles away, or two hundred miles away, if in fact you want business that’s on your doorstep. Then it’s a matter of them finding out. You can find them out via the Internet. You can even start using Google to find out, say, the local accountants in your area, or recruitment companies in your area, as in that previous example. I’ve got another fantastic example, as well, of a very different business, which is a boutique in Wales. Would you like me to share that example? Julie Stanford: Yes, because I think practical … the thing about practical examples is listeners can then think, actually, “I understand that.” It puts the light on much more quickly than, as you said, if you talk theory. Dee Blick: It’s very real, isn’t it? It’s very real. A great example was that a lady contacted me from Wales. She got this gorgeous boutique. She’s a personal stylist, and she was struggling. She’s opened this really fabulous boutique. The dresses are quite expensive, like £250 a pop. A bit out of my price bracket. Julie Stanford: Everyone. That’s my market. Dee Blick: That’s right. Everyone. In fact, everyone is not her market. Say you’ve got to have a bit of spending money to go into her shop. What we did, we sat down, did the same exercise, and we came up with the following lists: Wealthy ladies at lunch. We targeted the golf club. She immediately got a little show laid on at the golf club, and she invited the ladies that lunch at the golf club to actually come to her shop and have a bit of an open evening. We also targeted the slimming clubs, because, of course, when a woman is losing weight it’s when she starts to not only shed weight, she sheds her wardrobe, and she’s more open to indulging in that fabulous dress. She made contact with the heads of the local slimming groups and actually picked up the one. Again, not all the slimming groups, but the one where the woman, the leader who actually runs the group, was most responsive to her ideas. Dee Blick: Very much so. Dee Blick: You’ve got to laser in. It might be that you’ll end up targeting, as you said, different groups of people, but they are … you’ve got to define them quite clearly. Again, it enables us to craft really relevant, attractive, and charming messages. With this boutique in Wales, I actually got a message from her the other day, because she’d also targeted local business women that spend money, ie solicitors. She got immediately the first group of solicitors that she targeted. Not only did she get a group of them to come over to her boutique, she also got extensive coverage in a local magazine where she did a bit of partnering on the PR side. I got this lovely message saying that all of the campaigns were now under way. She’s not, thank God, done the leaflet-drop to all and sundry in the area. That, again, is going to cost her £600. It’s not like targeting everybody is cheap. This really has cost her time rather than money. She’s bringing them into her environment. She’s going out and doing shows, and it looks really fantastic. She’s gone from plan A, which was ‘let’s get a leaflet out but there’s no plan B,’ to suddenly … she’s got these really targeted little options. Julie Stanford: The other thing that I think, for the business owner, is that the excitement that will follow that, because there’s nothing more dispiriting and depressing than starting out with a vague idea of who you’re aiming your product or service at, then, as you said, either networking, or trying to find them on-line, or doing … getting your business card made and just handing it out to all and sundry, and nothing happens. You sit there in your office, or wherever your business is, ‘Billy No Mates’ with the phone not ringing and nobody getting in touch. Whereas, actually, what you’re describing there is a bit of excitement, energy, and in some respects they are coming to her. Dee Blick: Oh, gosh, yes. Julie Stanford: Her targeted customers, because there’s that perfect fit. She’s almost slotting in perfectly, and they are going to drive the relationship instead of that awful, tiring thing that I think a lot of businesses get into, where they’re having to do all the work. They’re pushing their message rather than fitting it so perfectly that their customer comes to them. Is that, do you think that’s right? Dee Blick: I think you’re absolutely right. It’s all about realizing that the desire is within certain groups to do business with you. It’s your job to actually find the people who have got that desire, which is what the document-shredding company did, which is what the lifestyle boutique did. It’s not finding everybody that might have a smidgen of desire, or no desire at all. Consequently you become so dispirited, you almost feel like diving under the duvet and shutting up shop. Dee Blick: I think that’s just so important. I think I’ve done the same with my own business, and the examples that I’m giving for every business that I work with. The very first thing that we do is build that picture of those perfect clients, and what they look like, and the groups they belong to, never forgetting that people buy from you based on a deep, underlying need for what you offer. It’s down to us to really tailor our understanding of that need, so we can carry the messages that count. My local hairdresser did it. We had a session together, and he was stoked. He’d done his, “Let’s go in the local papers” mentality. What we did was we approached slimming groups and gave the ‘Slimmer of the week’ a hair-styling, a real hair-styling to the changing shape of your face. Suddenly Vince, my hair dresser, was in front of forty women every week, at the local Rosemary Conley group, talking about his salon and the products, and bringing women in. What he did was, his hair-stylists that didn’t have a lot of work, they did the face, the hair and face styling. He made use of empty time by filling the salon with women who were actually interested in looking at how their hair could be styled differently to reflect their face. Get all this written down, so you’re actually starting from something. A bit of paper that’s got some valuable nuggets, rather than just walking out into the universe looking blank. Next thing is, get down to your local library. Info Trace is a free market-research service. If you don’t want to do that, get on the Internet. Clubs are in there. ‘Slimming groups in Horsham.’ It’s free data. Look at the actual websites, so you can start to think about “should I pick up the phone and communicate with these people?” if you’re looking to target a small number. Go down the library route to get that free, and it is free, a free market-research service. Next thing, when you’ve actually got that data, is start to think about priority. “I haven’t got all the time in the world, so who should I start initially communicating with, and why?” There’s loads more things as well, that actually I’ll come onto in further sessions, about populating that information so you’re talking to real people and not just data. That might mean, as well, you know, if you’re an established business, talking to your existing clients. Why did they buy from you? What did they find attractive about you initially? Not necessarily now, but what was the little snippet, what was the little flicker in that flame of interest that you engendered within them at the start that made them think, “I want to find out more about you”? Julie Stanford: Taking all that, the other thing I would suggest, as well, is that this is an ongoing process, isn’t it? Julie Stanford: You don’t just do it once at the beginning, and then stick the bit of paper in the drawer and forget about it. You have to constantly review that fit, don’t you? Dee Blick: You do, yes. Julie Stanford: “Is it still right? Are the people I’m trying to delight and charm, are they still the same? Or have things changed around me that, actually, there’s another opportunity that I haven’t even thought of?” It’s something that needs to be fluid. Dee Blick: It’s ongoing. It’s ongoing, and that’s the thing about marketing. It’s not just, “I’ve written it down on bits of paper, I’m sailing off into the universe all successfully.” It really is an ongoing process. You’ve got to look at the marketplace in which your target audience operates. What’s happening to them? Are they becoming really, “Oh, I don’t want to spend money on this service,” or are they a bit flush with money? Just trying to understand the pressures that are on them and, again, you can find that out just by subscribing to magazines that they read, by looking at on-line journals, by asking. Sometimes I think that in our desire to find that big marketing miracle at the end of the rainbow we overlook the fact that the answers are often in front of us. We think, “I couldn’t surely pick up the phone and ask a question.” What if you’d only pick up the phone and ask someone in your networking group? I think the power of asking questions is so untapped. Dee Blick: You’re so right. I think… I, definitely in my early years, I loved the sound of my own voice, and I still do love the sound of my own voice, but I have learned now to sit and listen and just throw in questions and take copious notes. That’s really what businesses can be doing. These things I’ve been saying today cost absolutely nothing, apart from the one big asset, which is time, that you have to allow time to do the marketing. What happens if you don’t break your market into these target groups? Julie Stanford: Now we have one minute left, and I just want to … just to really impress upon people how crucial this is that they do this exercise. What would be the impact of not doing it? What happens if you don’t actually tightly segment your market, as they say? Dee Blick: I think the biggest thing is if you don’t tightly segment, you run into the universe and you take anything that comes your way. In my experience with the businesses that I work with, you take on board business that sometimes can be a bit of an ill fit. It’d be like a suit that you buy, and the arms are too short, or the trousers are a bit tight. Doesn’t fit you right. You feel uncomfortable. What that means is you take on board business that some of it you’ve got to ship out. Some of it you’re not quite qualified to do, but you’ve said ‘yes’ because you’re desperate for the business, because there’s no business coming in. You almost end up evolving a bit of a higgledy-piggledy business, rather than focusing on your core strengths and your core brilliance. You end up trying to be everything to everybody, and in doing so delivering a bit of a lacklustre performance. Julie Stanford: They call it ‘diluting the message,’ don’t they? Julie Stanford: It’s really does … it’s like taking something wonderful and concentrated and pouring in loads of water. It becomes, I think, a bland message. Dee Blick: It does. It does become a bland message. I think as a small business owner, the biggest thing, as I say, you can give is not money. It’s time, so don’t waste your time trying to target everybody. You don’t have to ‘kiss lots of frogs to get your princes’. You kiss fewer frogs, and get a better quality of princes. Julie Stanford: I think, on that note, I think I have to end here, Dee. Thank you so much for giving us your nuggets of marketing… well, in-depth marketing wisdom today.